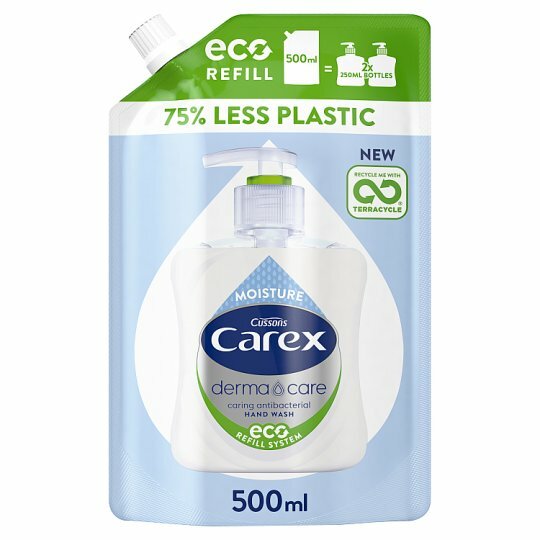 Antibacterial Hand Wash, with skin rejuvenating Vitamin E.
This Carex refill eco pack is the equivalent of 2x standard 250ml Carex bottles and uses 75% less plastic* so you can help to look after the environment. Cleans - Effectively removes dirt and germs. Cares - Contains a triple moisturising action to help skin feel soft. Protects - All-round protection for healthy hands. Directions: Uncap carefully and use to refill your pump pack. Ensure the cap is replaced tightly and pack is stored out of reach of children. WARNING: Avoid contact with eyes. If this occurs rinse well with clean water. Avoid contact with natural stone surfaces and stainless steel.